Mervat, 31, stands outside of her tent as she holds her 9-month-old daughter, Shurouk, at a camp for Syrian refugees in Lebanon’s Bekaa Valley on Tuesday, March 11, 2014. Credit: AP Photo/Bilal Hussein. Unrest in Ukraine, Syria and Iraq has prompted renewed attention about refugees across the world in recent weeks. But in the face of such news stories, long-term refugee trends are often overlooked. Using trend data from the UNHCR for 2002 to 2012, here are five facts – in marking of World Refugee Day on June 20 – that shed light on the changing shape of refugee populations around the world. 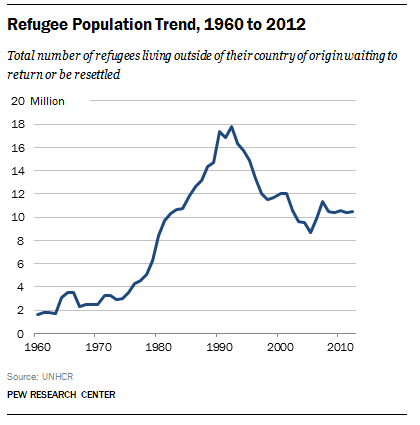 1The number of refugees has fallen from its 1990s peak. The number of refugees living in a foreign country who are either waiting to return or be resettled peaked in the early 1990s at about 18 million. During the 1990s peak, most of the world’s refugees were leaving Afghanistan, Iraq and other countries in sub-Saharan Africa. In 2012, Afghanistan, Somalia, Iraq and Syria were top countries of origin for refugees. But despite the ongoing conflicts in these countries, the number of refugees around the world is considerably less than it was two decades ago, numbering between 10 million and 12 million in recent years. 2More refugees are from the Middle East. As new conflicts emerge, the top origin countries of refugees can change suddenly. But with a growing number of conflicts in the Middle East associated with the Arab Spring, more refugees are fleeing their home countries in the Middle East and North Africa compared with a decade earlier. In 2002, 16% of refugees were born in the Middle East and North Africa, while that share rose to 22% by 2012. Despite this increase, most refugees are still from countries in the Asia-Pacific and sub-Saharan Africa regions. 3Most refugees are from low-income countries. Using the World Bank’s economic categorization of countries, most refugees are from low-income countries. In fact, the share of refugees from these poorer countries has increased slightly during the past decade, from 52% in 2002 to 57% by 2012. Top low-income origin countries include Afghanistan (2.5 million in 2002 and 2.6 million in 2012), Somalia (400,000 in 2002 and 1.1 million in 2012) and the Democratic Republic of the Congo (400,000 in 2002 and 500,000 in 2012). The lower economic position of refugees is very different than most international migrants who increasingly come from middle-income countries. 4Most refugees live in middle-income countries. Most refugees are not living in high-income or low-income countries. In fact, it is middle-income countries (often referred to as “emerging nations”) that are more likely to host refugees, from 51% of all refugees in 2002 to 57% by 2012. Examples of middle-income countries hosting a large number of refugees include Pakistan (1.2 million in 2002, 1.6 million in 2012), Iran (1.3 million in 2002 and 900,000 in 2012) and Jordan (1,000 in 2002 and 300,000 in 2012). By contrast, international migrants as a whole are increasingly living in high-income countries. 5More refugees live in a neighboring country than a decade ago. Although countries like the United States and Canada, as well as several European countries, admit thousands of refugees each year, most refugees do not travel far. Instead, most of the world’s refugees live in countries that neighbor their own. In 2002, about two-thirds (69%) of the world’s refugees lived in a country that shared a border with their own. In 2012, about three-fourths (74%) of refugees lived in a neighboring country.